Corbon Ammunition has been a proud family-owned and operated business for more than 30 years. Dedicated to growth, proven high-performance designs, and unsurpassed quality control, Corbon has become a well-respected name in the shooting world. Their modern, state-of-the-art production facility is located in Sturgis, South Dakota. 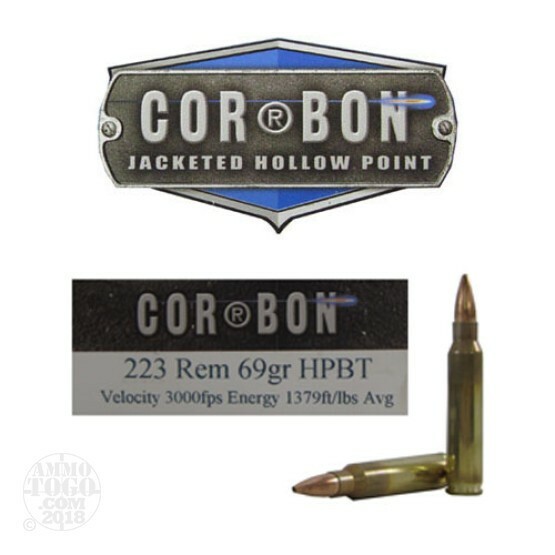 This package contains 20 rounds of Corbon Performance Match .223 Remington ammunition. Each cartridge is loaded with a 69 grain boat tail jacketed hollow point projectile. These heavy boat-tailed projectiles provide added stability and wind resistance, making the point of impact predictable for enhanced accuracy. This high velocity target ammunition delivers a level of accuracy perfect for competitive shooters of AR-15s and other .223 Remington rifles. This new production ammunition features low-flash, low-smoke propellants and produces relatively low recoil for more consistent shooting in rigorous, competitive shooting settings. This ammunition is non-corrosive, boxer primed, and features high-quality, fully reloadable brass cases. Each round produces a blistering muzzle velocity of 3000 feet per second and a muzzle energy of 1379 foot pounds.